We’re several weeks into the New Year… and this is traditionally the time when we’re already failing in our resolutions that we made three weeks ago. Last time Federer was upset this early in a slam, everyone was talking that his career was over. It must have been a discouraging time for Roger. His desire to play the game is still so strong, yet, these defeats will happen. So, now, at the ripe old (in tennis years) age of 33, is this his swan song? I can’t wait to see. After the last time he was defeated early in a grand slam in 2013, he played inspired tennis for 2014, and was so close to reclaiming his #1 ranking. He started out this year with his 1000th career win (see why I believe he’s the greatest of all time?). I believe that Roger will take this defeat and turn it into an even stronger, burning desire to compete and win. I don’t think he’s giving up yet. Wimbledon will definitely be the tournament to watch for him. Watching tennis inspires me again and again to fight my discouragement. I fought for years with my weight. About 2 1/2 years ago, I started to win the battle and lost 85 pounds! It felt so good. Now, the pounds are creeping back and discouragement is settling in. It would be so easy to have the attitude of giving up and belief that I will never beat this. That may be true. I’ll be fighting my weight for the rest of my life. However, knowing I have achieved success makes me hungry to achieve that success again. And that takes hard work. Roger Federer is the great tennis player he is from hard work. And like Roger, I need to go back to the “practice court.” Sometimes you have to start with the basics and build back up again. I need to start with what’s in my diet that’s sabotaging me. I need to get back to my strong exercise routine. We’ll see if I ever equal that 85 pound weight loss again. But I know I need to fight back. I feel stronger, more energized when I know I’m doing the right things. Whether I lose another pound or not, I’m going to fight this discouragement, one day at a time. 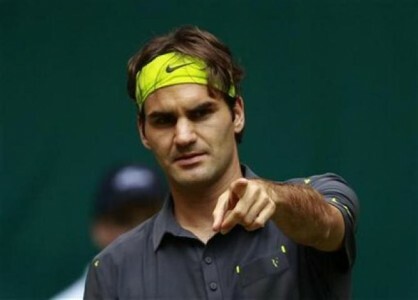 Roger will fight his discouragement one practice, one tournament at a time. So, if you’ve fallen away from the goals you set for the new year, today’s the day to take a step, pick up your racquet and step back on the practice court. Fight against the discouragement. You might be surprised how far you’ll go.